We have a selection of hand painted monogrammed baskets, clutches and bags. 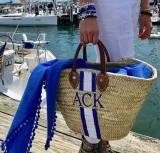 Monogrammed Hand Painted Stripe Straw Tote . . .